Mayor Rob Ford launched an “anti-postering” campaign as part of the city’s Clean Toronto Together initiative. “Ford says residents should use street furniture kiosks, not hydro poles, for community posters. City of Toronto’s image: Examples of poster-structures. 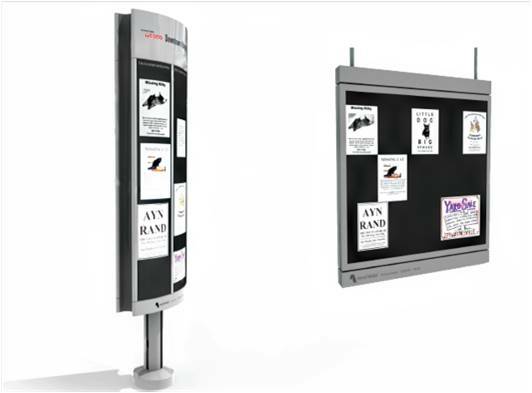 The campaign encouraged residents and businesses to use the City’s street furniture kiosks and message boards to advertise upcoming events and services instead of putting posters on hydro poles, bus shelters, utility boxes or newspaper boxes. Please help keep our city clean, green and beautiful by using the City’s public kiosks and message centres for your posters. More than 900 poster-structures have been installed, some in every Ward across the city. The approved structures are comprised of free standing columns and boards within transit shelters. The City of Toronto’s Poster on Public Property Bylaw states that any individual or company who is found or deemed to have placed or displayed a poster in a place in other than one permitted under the bylaw (Municipal Code Chapter 693-30) is guilty of an offence. However, posters regarding community issues such as a lost pet, a yard sale or cultural and/or religious events are permitted on locations other than City-approved structures. Enforcement officers will work their way throughout the city, across major arterial roads such as Finch Avenue, Eglinton Avenue, Bloor Street and Lake Shore Boulevard, beginning in Ward 1 to enforce the bylaw. Questions about posters on public property? Contact 311. Street Furniture Kiosks and Message Boards Brochure. View the Questions and Answers Section. Toronto Transit Commission (TTC)‘s Downsview Station closed Saturday, June 29. Scheduled track work will take place between Wilson Station and Downsview Station. Therefore, all trains on the Spadina subway will terminate at Wilson Station. A frequent shuttle bus service will operate between Wilson and Downsview stations. A Wheel-Trans vehicle will be on stand-by at Eglinton West Station in the event customers with accessibility limitations require transportation due to Wilson Station not being accessible. Normal subway service will resume on Sunday, June 30, at 9 a.m. The Toronto Transit Commission, in partnership with Spacing Magazine, is holding a contest to select photographs to be used on the cover of the TTC’s 2013 Summer and Fall Ride Guides. The photographs must contain images of TTC vehicles, stations, facilities or properties. The judges will select the winning photographs based on creativity, photographic quality and the genuineness/authenticity of the content. To enter, send an e-mail no later than Thursday, July 4 at 11:59 p.m. to ttcphoto@spacing.ca containing your name, address, postal code, telephone number and e-mail address, and attaching a maximum of five photographs. “Individuals irrevocably consent to the use of such winner’s name, likeness, image, voice, performance (in connection with any interviews and other recordings), biographical information, and statements relating to the TTC Ride Guide Photo Contest without compensation.Entries will not be returned. Entrants agree that, by entering the TTC Ride Guide Photo Contest, the entrant grants an irrevocably, perpetual, worldwide non–exclusive licence to TTC to reproduce, distribute, display and create derivative works of the entries (along with a name credit) in connection with the TTC Ride Guide Photo Contest, in any media now or hereafter known. Entrants consent to TTC doing or omitting to do any act that would otherwise infringe the entrant’s moral rights in his/her entries. TTC or Spacing Magazine will not be required to pay any additional consideration (monetary or otherwise) except as provided in Section 6 with such use. TTC reserves the right, at any time, to modify and/or use different photographs other than the ones selected. By participating in the TTC Ride Guide Photo Contest and submitting an entry, the entrant, (a) acknowledges that the entrant’s personal information (including name, telephone number, and email address) is being collected by TTC and Spacing Magazine for the purposes of operating, administering and promoting the TTC Ride Guide Photo Contest; and (b) the entrant consents to the disclosure of and access to the entrant’s personal information, to the extent that the entrant’s personal information appears in the entrant’s entry, inside or outside of Canada, for any and all purposes in connection with participation in, and the operation, administration and promotion of, the TTC Ride Guide Photo Contest. The entrant’s personal information is collected pursuant to subsection 26(c) of the Freedom of Information and Protection of Privacy Act for the purposes set out in this Section 10. The entrant’s personal information will not be provided to any third parties, other than as provided in these official rules. This Saturday, June 29, scheduled track work will take place between Wilson and Downsview stations. As a result of this work, subway trains will terminate at Wilson Station. A frequent shuttle bus service will operate between Wilson and Downsview stations.